If you are a regular reader you might have seen me mention a site called Cozi a few times before in notable newness posts. I have also mentioned them in tweets, on facebook and had posted about their current grocery giveaway just recently. I love their site! There are so many great tools and articles, I think you will love it too. 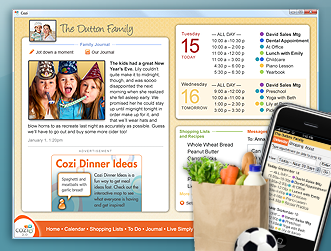 Cozi's site is full of information, tools and fun to help you get your family organized, live simply, and stay in touch! Shared calendars, to-do lists, a family journal and more are just a few of the things they offer. Do you ever look at the clock and suddenly jump up realizing you have no idea what to make for dinner? Well don't jump up next time, in fact sit down, and check out Cozi's Dinner Ideas page. I didn't know about this page until this week, but I love checking it out. When people tell Cozi what they are making using #cozidinnerideas, #dinner, or #whatsfordinner hashtags on twitter they collect that data and map it on that page. You can view what other people are having for dinner in real time! Scroll around the map to see what people are having in other neighborhoods or check out the area near you! You can get some instant ideas and hopefully something will pop out at you! Make sure to check out some of their articles on that page as well while you are there. Top Go-To Meals from Cozi Fans is a great article for ideas for dinner! Some of my other favorites are Top 10 Reasons You Shouldn’t Plan a Weekly Menu, Advice if You Want to Try Meal Planning, and Time-Saving Tips for Creating Family Meals. If you meal plan like I do you, or at least like to keep a monthly food budget, you know the importance of a good shopping list on your grocery store trips. Cozi has a shopping list tool that is fast, easy, and accessible in so many ways. You can even view your lists from the web, mobile web, text or even call a 800 number to hear your list read to you. So convenient! Want one more reason to check out Cozi to help with feeding your family? If you haven't heard Cozi has an awesome contest going on right now celebrating Cozi's 10,000,000th Shopping List Item! They are giving away free groceries for a year! Entering is as easy as entering your email address and they are giving TONS of extra entries. All you have to do is invite friends through email, twitter, your blog, etc. Every click you receive on the links you share gives you an extra entry! 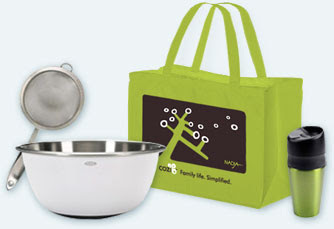 You can also spin to win OXO kitchen gadgets or a limited-edition designer Cozi tote 3 times per day, every day until the contest ends on March 11th, 2010. If you haven't started getting your entries in then make sure to head over today and start! It will only take a minute of your time and I'm sure all of us could use free groceries for a year! And make sure to check out the stuff I mentioned above and all they have to offer! This post was written on behalf of Cozi. All opinions are 100% my own. Stumbled! I like this, I have a Cozi journal haven't done much with it yet though!